100% Recycled, Plastic Free Toilet Paper. 400 sheets per roll (- that's more than your average loo roll in the UK), 3 ply Toilet paper. No inks, dyes or scents. Plus 50% of profits are donated to help build toilets and improve sanitation in the developing world. This recycled toilet paper is made from 100% post-consumer waste paper (things like textbooks, workbooks, office paper, etc). Primarily sourced from schools that are local to where the rolls are produced. No inks, dyes, or weird perfumes are used to make this toilet paper. 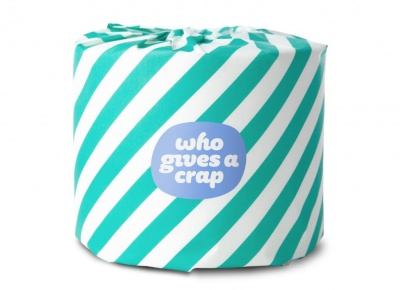 Who Gives a Crap will pulp the clean fibres at super high temperatures to ensure the paper stays biodegradable, safe in septic tanks and as strong as it is silky soft. And since it’s only tested on the finest human bottoms, this toilet paper is as good for your bum as it is for the planet. Toilet paper is one of those paper products that are ‘single-use only’ and can’t be recycled. This is why we think it’s crazy that more than 90% of the toilet paper sold is made from freshly-cut trees! This recycled roll is made from 100% post-consumer waste paper. Using recycled paper that's already in circulation, rather than cutting down and converting virgin pine into toilet paper to be used once then flushed away. By doing this it reduces CO2 and particulate matter emissions, as well as saving water. It's pretty great. The paper packaging can be reused for an art project or can be recycled. The colours of the paper wrapper may vary.